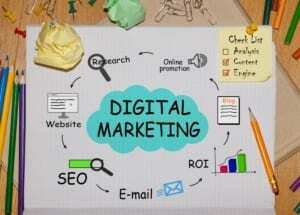 Digital Web World is an award-winning digital online marketing agency employing digital marketing experts with 30 years’ experience of ensuring growth for our B2B and B2C clients. We are recruiting for a number of digital marketing jobs at the moment but we recruit all year around to find the best people. We employ dynamic and trusted people to join our commercially minded, tightknit and friendly team. As digital marketing experts, we are motivated self-starters with a lot of initiative who work well in a team and independently. If you join us, you will join a vibrant, growing team of young people who all have something unique to contribute. We avoid bureaucracy and top-heavy layers of management, preferring an informal environment that rewards hard work and results. We are a digital online marketing agency with personality looking for team players who have leadership skills. We create digital solutions that maximise the return on your investment. We work with B2B and B2C clients across a range of industry sectors, redesigning and rebranding websites in multiple languages and running advertising, paid search and social media campaigns. Clients range from eCommerce pure play online companies through to manufacturing and service based businesses in the UK, France and Germany. Improving profitability for our clients is our life blood and the best way to measure our success. Our growth comes from having a determined team of professionals who put the customers’ growth and development objectives at the heart of what we do. By focusing on the customer, people and products we deliver smarter digital marketing. As a fully digital online marketing agency, geography does not constrain us. Our world is online and everything we do is optimised for the internet. We are masters of SEO and we are looking for an SEO specialist. Our digital account managers offer a personalised, professional service for clients. We continually monitor the success of our campaigns and make sure that we get results that take our clients’ businesses to the next level. Our clients become the leading brands in their industry. Digital Web World offers flexible working, free gym membership, a full pension, life insurance, a week away or long weekend rewards and the opportunity to volunteer and do agreed pro bono work. Look no further for digital marketing jobs. We are recruiting a digital account manager, new business development specialist, PPC specialist and SEO specialist. We recruit all year around so don’t hesitate to get in touch if you are looking for a different role using the contact form below. As a digital account manager, you will be responsible for positive client relationships that seamlessly grow their businesses by running well-positioned campaigns. You need to understand client objectives and priorities and become an invaluable partner to them and their business. You will create perfect digital journeys that are delivered on time and within budget. You will be commercially minded to support your client when managing revenue, forecasting and ultimately maximising profitability. If you join us, you will also look for new business opportunities. You will join a team of digital marketing experts and work alongside digital account managers and directors to identify new clients and nurture those relationships. You may be the first point of contact within the business so excellent communication skills and commercial acumen are essential. If you join us, you will need to demonstrate experience of attracting new clients and building robust and positive relationships proving to them, their need for a digital partner, that is, Digital Web World. You will be responsible for the implementation and delivery of the digital strategy and for day to day management of selected client accounts. Your focus will be on growth and profit and you will be determined to achieve the best possible results for each client on time. If you join us, you will use all available marketing channels to run innovative campaigns including SEO, social media and email as well as PPC and paid media. You will report on the campaigns and work with account managers to communicate campaign strategy, progress and results. You will bring your enthusiasm and experience of digital to benefit your B2B and B2C brands in the UK and across Europe. As an SEO specialist, your role will be technical and creative, running innovative campaigns that will include social media and require a significant amount of thought leadership. You will understand your clients’ strategy, launch and monitor campaigns and measure their impact over time. You will remain within budget and ensure value for money. Quality assurance will be key to your role and your performance will be measured by results. If you join us, you must have good communication skills because you will have frequent client contact via email, telephone and face-to-face meetings. To apply upload your CV with a covering letter outlining why you are the best person for the job. Digital Web World is fully compliant with GDPR and takes data protection very seriously.